Last week, I watched and listened to General Conference of The Church of Jesus Christ of Latter-day Saints, of which I’m a member of. I enjoyed watching, listening, and taking notes from all of the uplifting talks that were shared. In one of the talks by President Russell M. Nelson, he asked the women of the church to participate in a 10-day fast from social media. I have been wanting to do something like this for a while, but always used the excuse that I couldn’t because I work online and get paid to schedule other peoples social media as well as use it myself to help promote this blog. Well, I decided that I could wait to share somethings on social media until after the social media fast, so I jumped in and I’m doing it. I’m a few days into it now, and I’m not going to lie, at times, it’s hard! I just want to click on those apps on my phone and open them up and scroll for a bit. I wonder what I might be missing, although, I’m sure it isn’t anything too important. Why does social media make us feel that way? I am hoping that after the 10-day fast that I’ll be able to have a healthier relationship with social media than I have had. I know it would be good for me. Plus, I can’t believe all the extra time I’ve had since I haven’t been on social media! I’ve gotten a few different projects done, and it is so fun to just sit and create! I’ve also been more patient with my boys (I’m sure they can appreciate that)! Anyway, in case you’ve been missing me on facebook or instagram the last few days, now you know why. 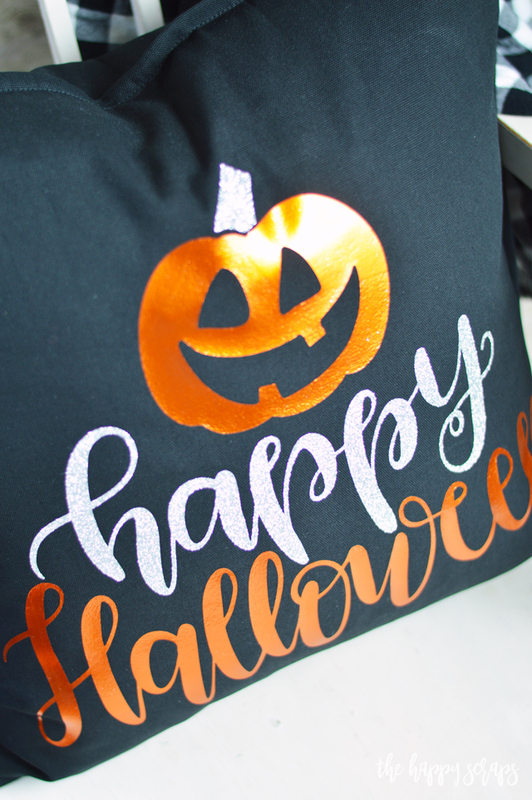 However, since I’ve had extra time, I whipped up these cute DIY Halloween Throw Pillows and I’m excited to be sharing them with you today! 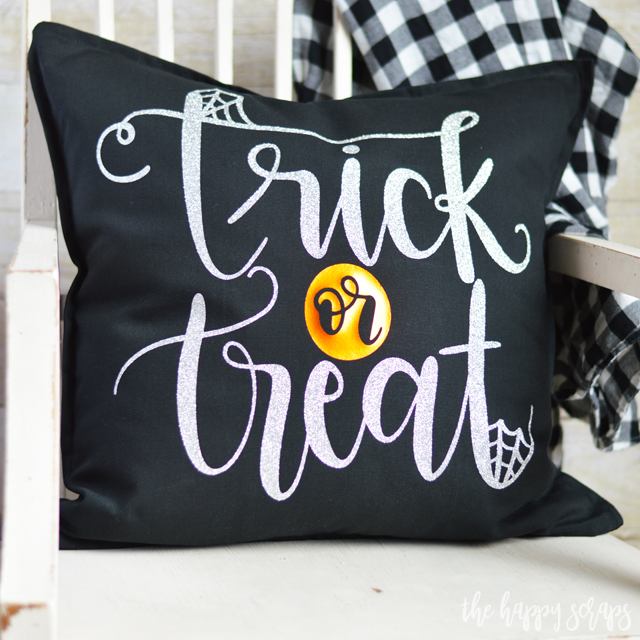 This DIY Halloween Throw Pillows post contains affiliate links. If you click on an affiliate link and purchase something, you won’t pay anything extra, but it will help support this blog. All ideas and opinions are my own. When I decided that I wanted to create some fun new DIY Halloween Throw Pillows, I started looking for designs. I found a few options then I looked right in Design Space to see what Halloween designs were there. I found these two plus several others. If you have Cricut Access, then these are included in it. If not, I think you can purchase the images for a minimal fee. Aren’t they so cute?! I love them and knew that I need to use these designs for my new pillows. I used the template for throw pillows in Design Space to get the sizing of the designs right. I did have to split the trick/treat so that they cut separately because they were too big to cut on one piece of iron-on or HTV. I like that I can set the template in Design Space so I can better visualize what I’m working on. Once I had the designs finalized, I clicked the “make it” button. Because the silver glitter iron-on that I was using was 12″x 19″, I had to adjust the designs after I clicked “make it”. You could adjust this before, either way will work. 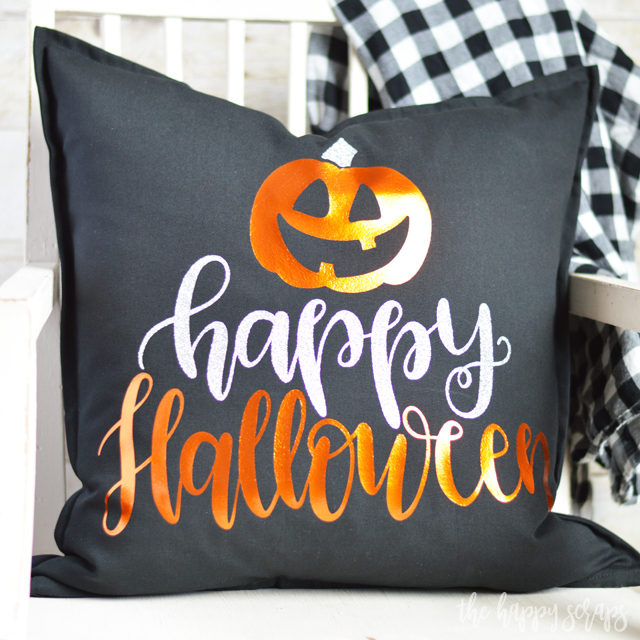 I had the pumpkin stem and the word happy that were spaced just right for the pillow to line up with the pumpkin and halloween, so I didn’t want to move them separately, but you could. I put the stem right by the web on trick. I started cutting. 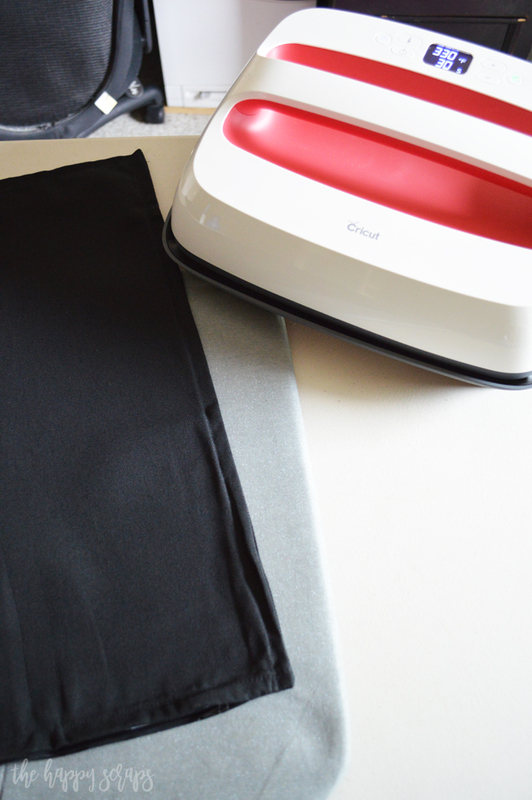 When cutting iron-on materials you always want to mirror your images! Once I had the designs cut, I trimmed the extra iron-on/HTV from the pieces. I like to save as much as this stuff as I can! I used the weeding tool kit to weed the designs. Then I cut the carrier sheet where I needed to, to separate the pumpkin stem and trick from each other. I used the Interactive Quick Reference Guide to determine what settings I needed for the EasyPress 2 and started it preheating. 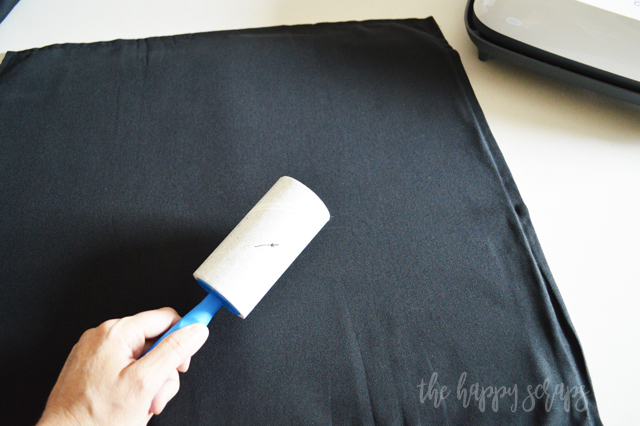 TIP: Clean up the pillow covers by using a lint roller. 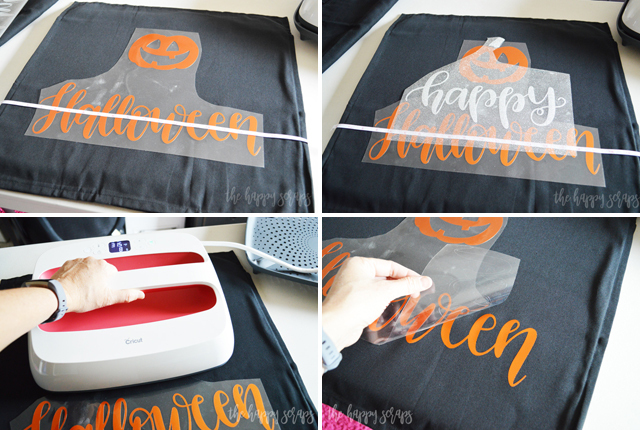 This is super easy and quick to do and then you won’t have any random things stuck under your designs! Once I had the designs weeded and the pillow covers ready, I placed the first layer on the pillow. Note: If I were to do this again, I would apply the glitter iron-on vinyl first and then the electric orange second. The glitter carrier sheet holds some extra glitter that ended up on the electric orange designs. 🙂 I measured to make sure that I had the design centered. I placed the glitter layer over the top to check and make sure that everything lined up properly. Then I removed the glitter layer and pressed the electric orange. Once I pressed the front and back (as recommended in the Interactive Quick Reference Guide) I peeled up the carrier sheet. Once I had the electric orange on the pillow cover, I placed the glitter iron-on in it’s place. Then I placed the carrier sheet from the electric orange back over the top of the design, to make sure all of it was protected. 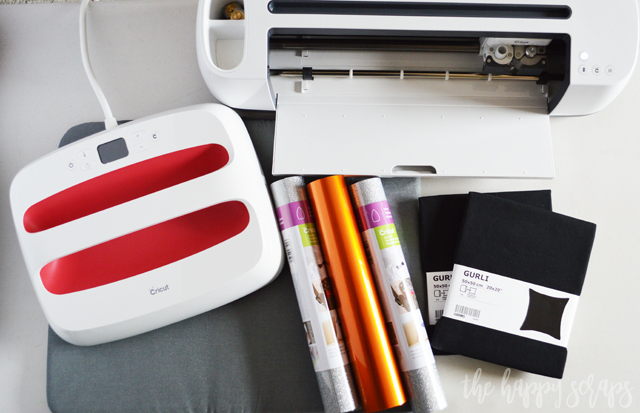 I applied the heat using the EasyPress 2 for the silver glitter iron-on. Once I pressed on both sides, I peeled the carrier sheets off. I seriously adore the way this pillow turned out and I love that I found this design right in Cricut Design Space so I didn’t have a need to design something myself, or find something else where. 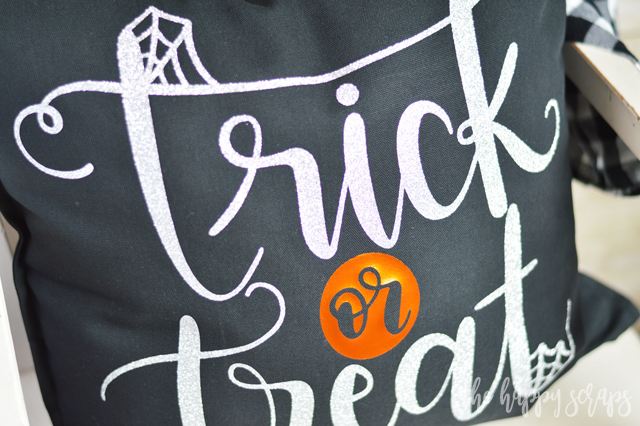 The pumpkin is the perfect added touch to the lettering and I love that I used the electric orange for the pumpkin + Halloween. The combination of the electric orange and the silver glitter is perfection! 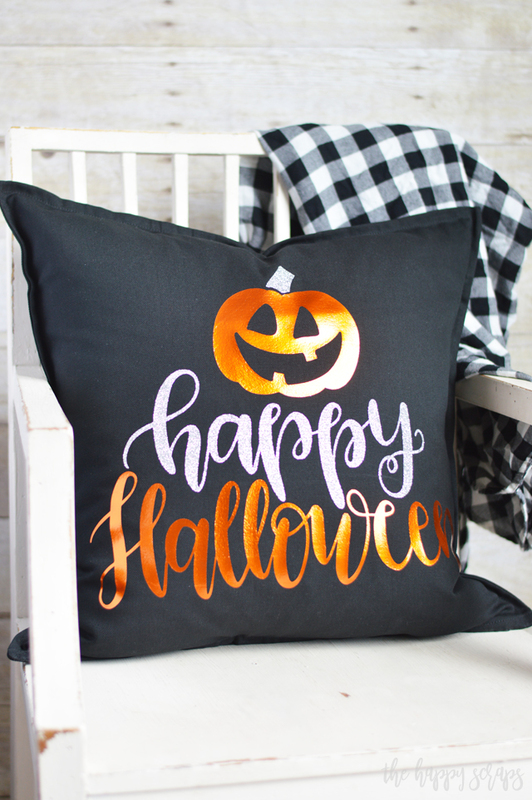 I added both of these fun DIY Halloween Throw Pillows to my living room, where the majority of my other Halloween decor is. It goes great with the Trick or Treat pillow below. I put this Trick or Treat pillow together basically the same way. I did, however, apply the silver glitter layers before I applied the electric orange. I would say that either way they turned out great! 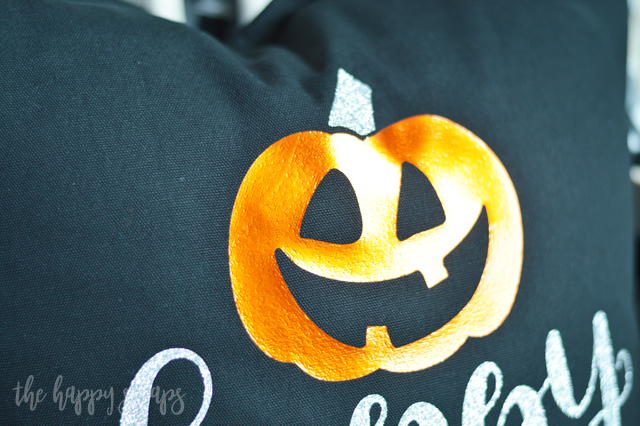 I wish you could really see the way the electric orange shines on these DIY Halloween Throw Pillows. It’s so hard to take a picture of it. The silver glitter and the electric orange are the perfect combination on the black pillow cover though, don’t you think? 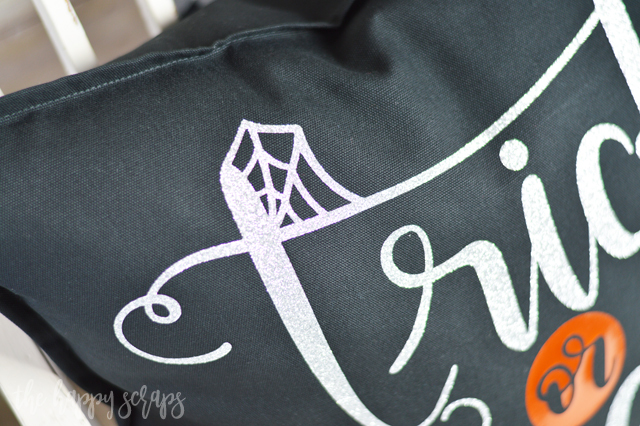 I love the added detail of the spider webs on this trick or treat design too. 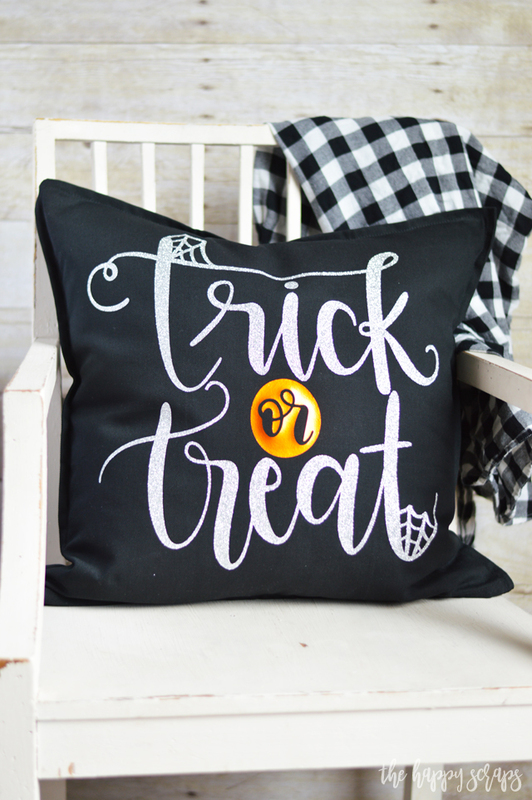 Do you have the perfect spot in your home to put these DIY Halloween Throw Pillows? 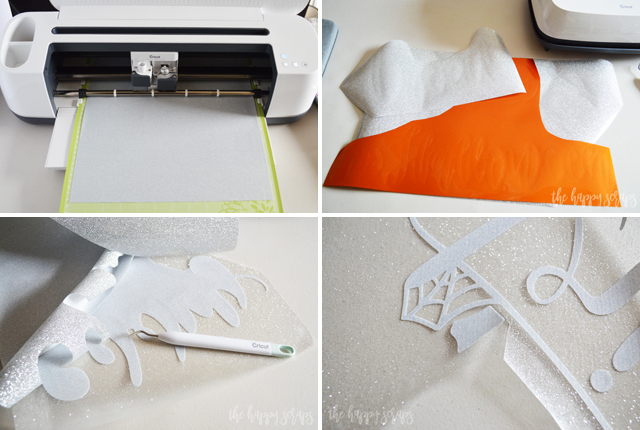 If you’re looking for more fun Halloween projects, then check those out here. 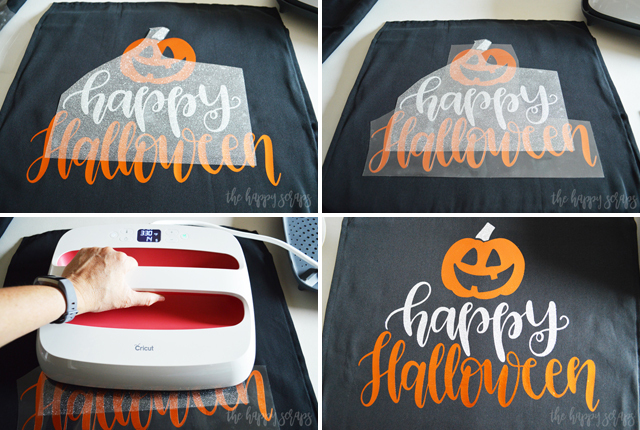 If you’re looking for other great ideas to use your EasyPress on, be sure to check out the iron-on gallery here.